I wanted to share some news with you. In my Juice Plus business I’ve learned that to build a ‘dynasty’ you need to understand the ‘culture’ of the people coming into your organization and also the element of knowing how to promote an event that will attract “not only veteran and new distributors” but design a program where a ’new’ guest will walk in and say WOW! My game is promoting. For 40 years I’ve done nationally televised shows on all the major networks. What I am about to show you will astound you in ’the’ promotion of this phenomenal event being promoted within the Juice Plus Company. I’ve seen various promotions throughout the year but NOTHING like this one. Details are perfect for YOU, the franchisee, to FIND A WAY to bring NEW PROSPECTS and NEW SIGNEES. I can guarantee you the makings of this promotions will WOW you. First listen to this short 30 second audio from NMD Andrea Bohn from San Antonio. Next I was interviewed by Andrea for a short 2-3 minutes about this upcoming event on her TOP PERFORMERS TV show and am excited she asked me. Andrea Bohn, Danette Blair, and Lori Kendall are arranging an event that could be the making of something that will set the stage for future events…..FUN…EXCITING…and full of ENERGY for you to be part of something BIG and teach you HOW to build a dynasty with your JUICE PLUS business. Tune in below to experience a “show” (event) like never before. Here is the Jay Martin video, a man who started this billion dollar company in an apartment with less than $5000 and developed an international company setting records with a product that will be with us forever….As we all know, fruits, veggies, and berries will never be a fad and will be with us until the end of time. Enjoy. I have to tell you…..this is an opportunity of a lifetime. 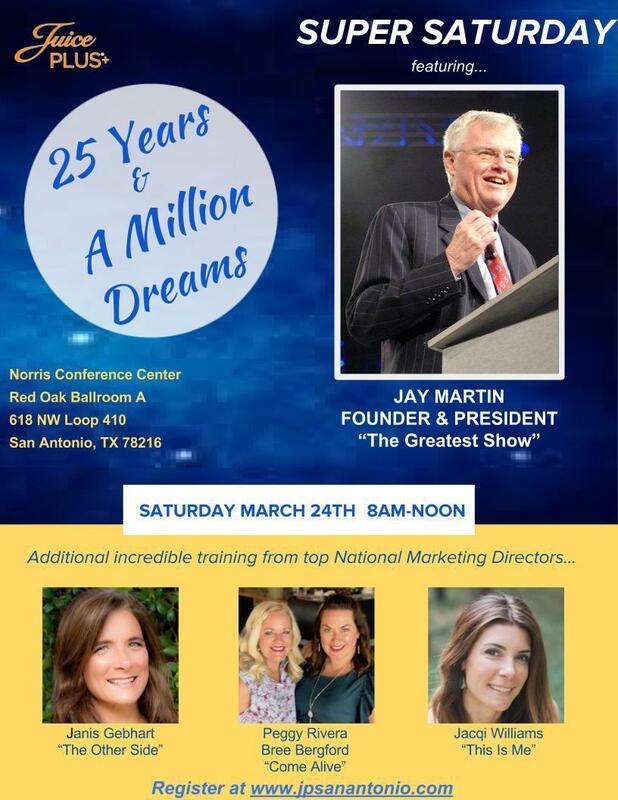 Learn from the dynamics of this promotion called a SUPER SATURDAY and see why the attendees who go to these “ TRAINING HOTSPOTS” DO BUILD A DYNASTY. Order your ticket now at www.jpsanantonio.com . I promise you will wish you had brought MORE people.